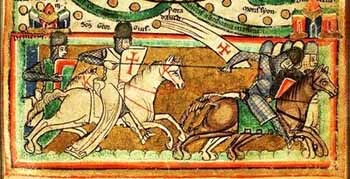 Why do we have a magnificent idea of a Catholic warrior such as Godfrey of Bouillon? Why does a chaste warrior such as Don Sebastian of Portugal present such a superb image? It is because chastity gives the warrior a special splendor. His courage is different than that of the bold braggart; he has a strength of soul in which his spirit dominates matter. He understands that the fight is necessary, and he wills to enter the combat with a strength that only chaste men can have. Then, he enters the battle with a Catholic heroism that is wise and unbending. 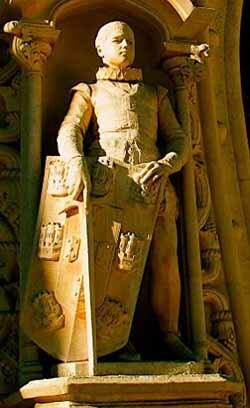 In the Middle Ages there was an Order of Chivalry, the Knights Templars, whose members pronounced four vows. They took the normal three vows of all religious orders – poverty, chastity and obedience – and then added a fourth. Only chaste men have the courage to pronounce this vow: To never retreat in face of the enemy. Even if they were far outnumbered, cut off from the others or on the verge of being taken prisoners, they could never flee. They had to die attacking the enemy, fighting to defeat it. The result: those men constituted an Order that was inexpugnable. It was common for them to win battles when they were outnumbered 10 to 1 or even more. They would win because they did not retreat, and they did not retreat because they were chaste. Chastity gives man a strong will that the impure man does not have. The impure man, who tramps in the the mud of the excesses of concupiscence, can be a bold man who faces this or that danger, but he does not have that determination which makes him unconquerable. He cannot be an invincible warrior who fights like St. Michael the Archangel – the angelic warrior who defeated Satan and his cohorts and cast them into Hell. Thus, that chastity is not just abstaining from the sexual act. It is this, but it is motivated by a primacy of spirit that chooses what is better, a supreme value of human nature, a super-excellence for man. The chaste man dominates what is weaker in himself and subjects it to the government of what is stronger and more elevated. This internal order in his soul radiates in his very person, giving him the supreme respectability that belongs to the chaste and virginal man. Chastity is, you can understand, a powerful factor of civilization. The Reign of Mary will be, from a certain perspective, the civilization of chastity. There will be chastity in matrimony, which means fidelity to the conjugal vows. There will also be many persons who will renounce the bonds of marriage to consecrate their lives to more elevated things in different states of life – as priests, religious or lay people living in the world. It will be the reign of chastity of spirit, which, more than chastity of body, brings forth the plenitude of intelligence, strength of will and internal harmony of soul. I close this series affirming that we can see how chastity is such a great ornament of the human person by contemplating Our Lady, the greatest work of art Our Lord Jesus Christ made for all the centuries. All the perfections combined that men had and will have until the end of the world are not comparable to the perfection of Our Lady. She is the highest paradigm of mankind after Our Lord Jesus Christ. He deemed it indispensable that, among her multiple virtues, she should be chaste, that she should be a virgin even during parturition. This virtue is so elevated He did not want her to lose it like other mothers. So, He worked a miracle – the virginal birth of Our Lord. Our Lady was a virgin before, during and after giving birth to Him. Virginity has such a prominent place among the virtues of Our Lady that she became known as the Virgin par excellence. In the Litany of Loreto, she is acclaimed as Sancta Virgo virginum, Holy Virgin of virgins. She is to other virgins as they are to persons who are not virginal. This is what Virgin of virgins means; this is how she is glorified. When someone says, “The Virgin did this or that,” it is already understood that he is talking about the Virgin par excellence. Virginity is the most splendorous of all the virtues of Our Lady. Our Lord also wanted His foster father to be a virgin. St. Joseph had made the vow of perfect chastity, which he maintained all his life. The Holy Eucharist is said to be the bread and wine that generates virgins. Through the grace of God, the Holy Eucharist engenders admiration for purity and the strength to maintain this state. If he does this, he can attain the state of purity and preserve it. Then, it is possible. It may remain difficult even then, but it is possible. Further, it can even become easy to maintain it. For this reason – because grace exists – the Reign of Mary is something that becomes possible. It is grace that will give us many pure generations, chaste generations, that will be the foundation for the Reign of Mary. 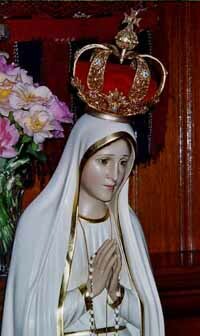 It is for this reason that I say that the Reign of Mary will be the civilization of chastity. It will be the Reign of that one who was, above all, a Virgin, and whose fecundity was a fruit of her virginity. She would not have been chosen to be the Mother of Christ if she were not a Virgin. The Reign of Mary will be the reign of purity and, as a consequence, it will be the reign of abundant and fecund families. It will be the Reign of the supernatural, of men and women with a chaste and strong formation. It will be the perfect City of God, where faith will dominate the spirit and the spirit will dominate matter. It will be the epoch of the greatest glory and splendor to occur in History. May Our Lady help you to understand this truth and love it, and to dedicate your life to serving Our Lady through the practice of chastity.